A reader wrote this week to ask a question about my freight car mix. It’s a good question, so I thought I’d share the answer here as well as responding directly. Yes, I’m planning on adding more CNR boxcars. In fact, I have five or six kits from Pacific Rail Shops, and at least one other Ridgehill kit for a Fowler car in my collection. But, they’re kits. The Fowlers are resin, so a fair bit of work. The PRS are injection moulded, but need modification to better represent CNR prototypes. In addition, I want to model a variety of CNR cars, which will require kitbashing the PRS cars. My goal is to have CNR represent 80 percent of the cars on the layout, at any one time. The off-road cars will make rare appearances – maybe one on the layout at any time – to add a bit of variety. Yes, the TH&B yellow double-sheathed car and the ATSF boxcar are a bit of a stretch. But not as much as the Central of Georgia ventilated car or the B&O wagon-top covered hopper! Having said all of that, my focus right now is on the layout – not equipment. So I have a number of ready to run cars (like the boxcars mentioned above) that give me sufficient rolling stock to run trains. At some point I’ll turn my attention to the PRS kits and get another half-dozen CNR boxcars on the layout. It’ll make a big difference! 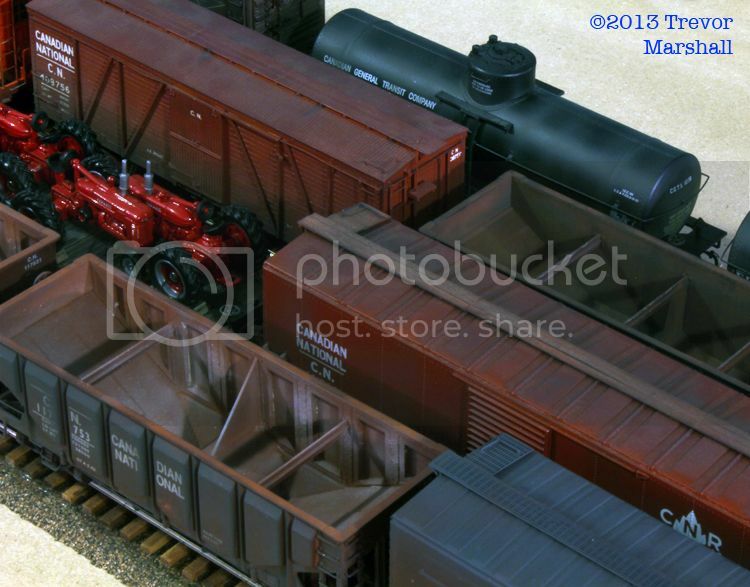 This entry was posted in CNR boxcars, equipment, Other freight cars by Trevor. Bookmark the permalink. I can vouch for having a number of boxcar kits and cars ready to paint that will in time become CN cars. Modelling a grain-haling line in 1956, I need boxcars and boxcars and boxcars, and… But some cars are actually built, too! Really. 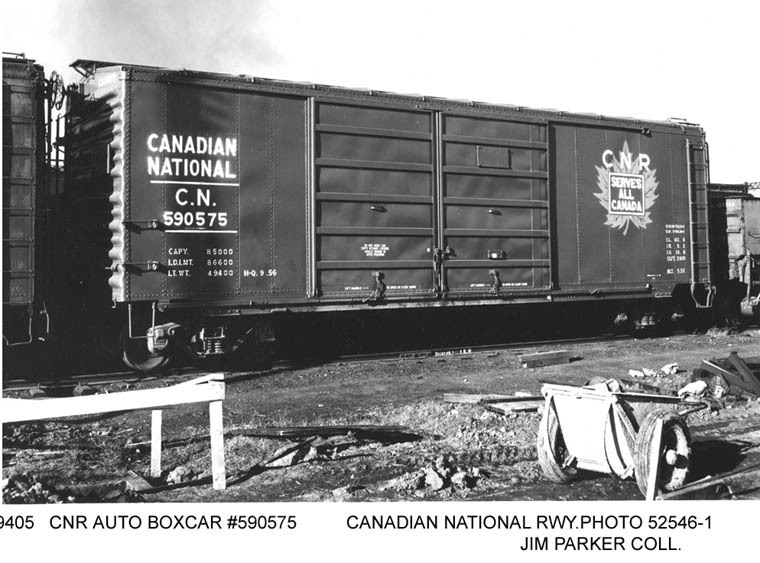 CN had a great variety of detail differences within their “standard 40′ steel boxcar” fleet. Off the top of my head–Six different rooves. Six different end designs, with 10′ and 10′-6″ i.h. variants of those. CN even had three aluminum-sheathed cars built in 1945 or 1946. And then you add in cars from, for example, the GTW –two different detail variants, welded vs. rivetted sides on the same 40′ steel carbody–I’ve built a model of each. Plus what CN inherited from the predecessor roads, then had built in the 1920’s and 1930’s, and CN equipment alone has a fair bit of variety for the layout. And we haven’t even gone into the subtle body colour and weathering variations that each car had from its mates. This is about one of the photos that show up when you first enter the website. I really like the picture of #86 on the turntable Nice shot! There are some other nice ones, but for some reson that one tends to stick out for me. Glad you like it. I believe the photo to which you refer is the B&W version of the picture in this posting. Don’t worry too much about the CofG boxcar making the occasional appearance. By all accounts, due to the nature of their loading (produce) they could turn up all over North America. Plus, of course, it’s a lovely model! Here’s a pair of Seaboard Air Line ventilated box in Toronto in the 1950s. Nice find – thanks for sharing! My rationale is that the Long Point Corporation – comprised of several very wealthy Americans – order melons for their annual get-together. You mention in an earlier blog about 7 panel doors. Might these work? Thanks for the find! Unfortunately, I’m looking for a six-panel Superior door. 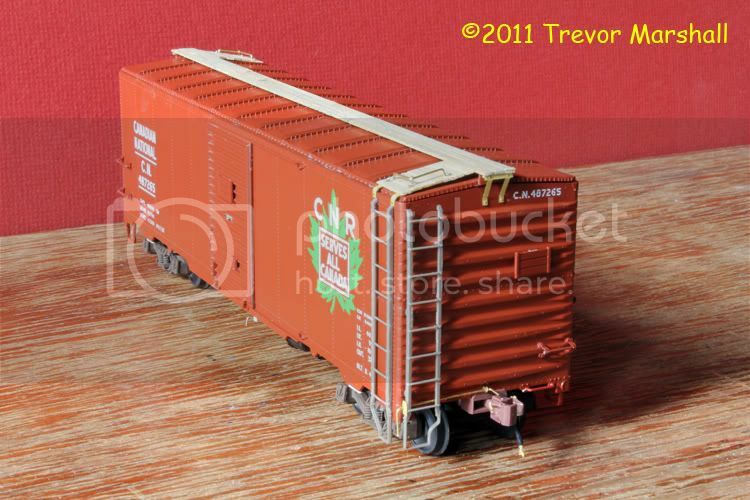 Here’s a photo of the double-door boxcar that I’m modelling.